The visionary legacy of Aldous Huxley is as relevant today as ever. Huxley possessed a sober understanding of the human condition as well as an inspired vision of the human potential. 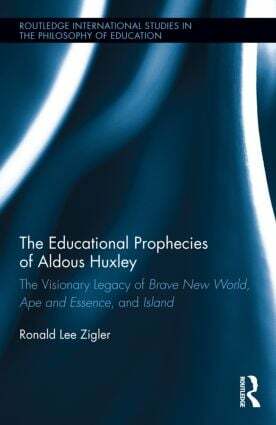 This volume presents an interdisciplinary examination and appreciation of Aldous Huxley’s three visionary novels – Brave New World (1932), Ape and Essence (1948), and Island (1962) – to reveal the extent to which Huxley’s prognoses into our possible futures was prophetic. The author assesses each novel to reveal the foresights that define our current educational, social, religious, political, and economic institutions, while also exposing our conflicts within those institutions. This volume examines the educational, cultural and technological changes that have shaped our society since Huxley’s work, with special reference to the enduring legacy of educational philosopher John Dewey. It offers profound insights into the educational forces and moral foundations of our society that shape us, both inside and outside of our schools. It is the first of its kind to focus exclusively on all three of Huxley’s visionary novels and detail their relevance to our world today. Ronald Lee Zigler is Associate Professor of Educational Psychology at Penn State Abington, PA, USA.